The information on this page is provided to help teachers prepare for the show and provide post-show discussion points and follow-up activities that support Common Core State Standards. Post show Study Guides for "Tuneful Tales"
Each presentation is 45 minutes long and includes two multicultural folktales. If you have a preference for a particular story please discuss it with your assembly coordinator. We are happy to honor requests whenever possible. Please use the activities on this page to prepare your students for the program. Then follow the links for in depth study guides for each story. Tuneful Tales (May 2018 - May 2019) is a collection of stories that highlight musicians and/or music. 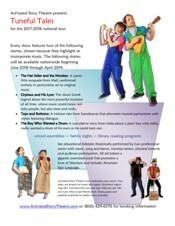 The production is presented by 2 professional performers at schools and libraries all across the United States. Ask students to listen carefully so that afterwards they can answer simple, factual, objective questions such as who, what, where, or when. Discuss appropriate audience behavior with your class so they will know what is expected of them. Remind them to be respectful of others by sitting flat on the floor so all can see and enjoy the presentation. Laughter and applause and at times responding verbally are appropriate. Clapping at the end of the show is polite. Students are expected to stay in the designated audience area. Crossing the line to the performance area, even to help pick something up, is not appropriate or safe. If the performers drop something on the stage, please assume that it is part of the act. Only guest stars are allowed on stage during the performance during the prerehearsed scene. Define and discuss what a folktale is. (A folktale is a story passed down from generation to generation.) How does a folktale differ from a made up story, fairytale, legend or myth? What is the same about all of these genres? Read and/or listen to one or more of the Act!vated folktales with the students. Familiarize your students with American Sign Language (ASL). They should know what it is, who uses it and why. Discuss the reasons the performers use American Sign Language in the show. Put eye-catching fliers and/or poster on the classroom and hall walls announcing the upcoming show. Posters and or fliers for your event are availble by request. Versions that students can print and color are available by special request. Up to 12 students may be invited to attend a half-hour pre-show workshop to learn roles and perform in the show. Guest Stars will be attending a mandatory half-hour pre-show workshop before the first show. Deaf students who use ASL are welcome to participate as Guest Stars. Please check with your assembly coordinator for details. When choosing students to represent your class please choose outgoing students who are quick learners. Sometimes this is the child who "acts up" in class, but only if they are capable of following instructions. The students you select to participate will practice and apply skills and strategies for effective communication by learning to be expressive, face the audience and adapting vocal volume. They will develop listening skills while learning about cues and following directions. Throughout the performance students will be applying listening and observation skills to recall and interpret information. As a member of the audience they will respond to the speaker with encouraging nonverbal communication (e.g., sitting still and watching the speaker). They will develop an understanding of story sequence. They will see that literature represents different cultures and traditions. They will learn new vocabulary and possibly some foreign words. They will observe American Sign Language and other forms of non-verbal communication, such as dance and pantomime. These activities can be used to prepare students for the show or as post-show follow-up. Have the students check out folktales from the school library to read in class. Ask them to look for books with j398.2 (Dewey Decimal System) on the spine. You can explain how to find the spine of the book to younger students by telling them to open their arms wide and pretend to be a book. Then act out a book opening and closing by opening and closing their arms. Next ask them where their spine is and point out it is in the same place on a book. Learn some American Sign Language using books, videos or Internet. Adopt a few ASL signs to use every day in the classroom. Have the students retell folktales to the class. Children act out stories before they learn to read. Ask students to act out a folktale as you read it to the class. Choose according to the stories your students saw presented for story specific follow up activities. Have the students retell the important events in the stories with correct sequence of events. Ask questions (who, what, where, why, when, how) about the show and the stories. Solicit feedback and ask them to expand upon what they say by making personal connections. Discuss the setting, characters, problems, solutions and events in the stories. Compare and contrast the two stories. What is the common theme in both stories? What are the similarities and differences between characters, settings and important events? Continue the classroom discussion while the students draw pictures of a scene from the show. Hold a class discussion about ASL. See if anyone remembers any signs from the show. Ask the guest star(s) to demonstrate what they learned in the preshow workshop to the rest of the class. Immediately after the show, ask the class to brainstorm a list of things they thought about the show and write the list on the board. Then ask the students to individually write a letter. They may address the letters to one of the characters from the show or to one or both of the actors. They may use ideas from the list the class created or come up with their own. The performers are typically on campus for at least forty-five minutes after each show striking the set and loading out. It should be possible to hand-deliver any letters or artwork. The performers will check with the office on their way out. If you want to leave them there they can pick them up. Use a graphic organizer to state the main idea of one of the stories and list important details. Complete one together with the class, before having each student do one for the other story. Character descriptions. Write the names of the main characters on the board. With the class list 10 adjectives below each that describe that character. Have each student choose a character and write a paragraph explaining why they liked that character and compare themselves to that character. These projects take more time and dedication but are well worth the effort. Practice reading, speaking and theatre skills by having the class work together on presenting a story. The tale of Orpheus (.pdf) is available for classroom use (10-30 students). It may be produced as simply or as elaborately as you like. Arrange to have the students perform for another class or parents if possible. Students expand reading, vocabulary, listening and speaking skills, while communicating with a worldwide audience; learn about sound (science) and work with electronic media. See our Podcasting Stories project guide. As a culminating project, students write their own folktale-inspired story, perhaps combining two folktales to create a new story or making themselves the main character. Each student reads his or her story and solicits feedback from the class, then rewrites the story elaborating on ideas, adding descriptive words, making improvements and corrections. The final versions of the stories can be put together in a book and published using sites such as Lulu.com which will print them at cost and on demand. Art work may be included (black and white is best). Order a copy for your school or community library and invite parents to order copies for their children as well (you may choose to use this project as a fundraiser or just order the books at cost). Don't forget to have the contributors sign the library copy at a book-signing party once it arrives. And please let us know about it - we'd love to see what your students came up with!